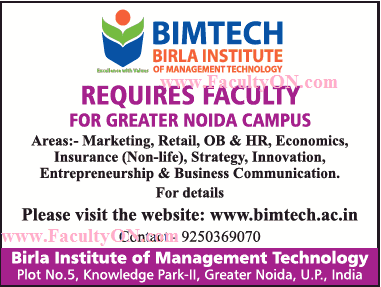 Birla Institute of Management Technology, Greater Noida has advertised in THE TIMES OF INDIA newspaper for recruitment of Associate Professor / Assistant Professor jobs vacancies. Interested and eligible job aspirants are requested to apply on or before 15th April 2018. Check out further more details below. About College: Birla Institute of Management Technology was established in 1988 under the aegis of the Birla Academy of Art and Culture, and supported by Birla group of companies. Dr. (Smt.) Sarala Birla, chairperson of Birla Academy and Syt. B K Birla, chairperson of B K Birla Group of companies are the founders of the business school. The Board of Governors is comprised of eminent people from industry and headed by Smt Jayashree Mohta, Vice Chairperson, Birla Academy of Art & Culture, Kolkata.